We have just uploaded the 83rd episode of the Alien vs. Predator Galaxy Podcast (right-click and save as to download)! Our latest episode sees regular hosts Corporal Hicks, RidgeTop and Xenomorphine joined by community member Ultramorph to breakdown and review the latest Aliens comic series, Aliens: Dust to Dust! Beware spoilers! 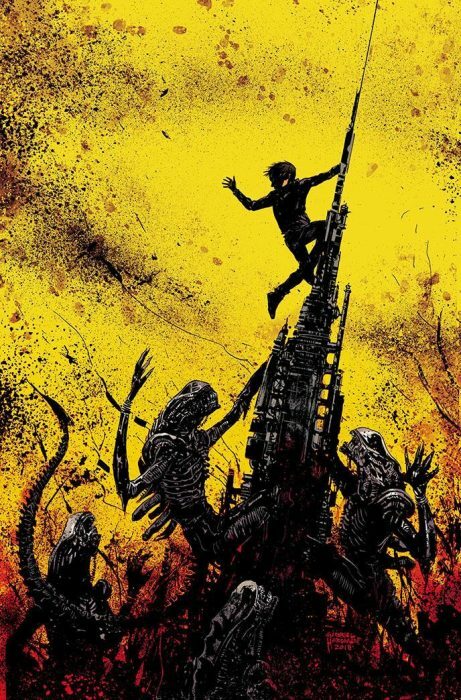 Gabriel Hardman’s cover art for Aliens: Dust to Dust #4. We discuss the series’ controversial DNA reflex inclusions, world-building through design, individualising Aliens, the technicalities of ambiguity and plenty more! And, of course, the usual side tangents related to other comic and the expanded universe in general such as the Big Deletion! At one point we talk about Aliens: Earth War/Female War but don’t know who the colourist was. Monika Livingston did the colouring for the original run and then it was later recoloured by Sam Keith himself for later collections of the series. Finally had a chance to listen and as usual great podcast fellas, always a fun time! I’d probably score the series 8/10. I’ll be holding off on the new podcast until I’ve seen all the shorts but I’m really looking forward to the Johnnie Christmas interview. Fantastic Pod... again. Thanks guys. I thoroughly enjoy these. Keep up the great wok. Ask Gabriel? He's on Twitter. I'm gonna to stay suspicious untill the opposite has been proved. I had completely blanked that from my memory. But I'm with Old One, I doubt it was an intentional callback. We also saw one of the twins lose an arm in Dead Orbit. Negative / I seriously doubt it. There are fans who have a problem with the aliens killing each other in Resurrection? I agree with Hicks. It's probably my favorite part of the movie. I really feel like the only thing he did to make it ambiguous was the moment where Mom lunges at him. The whole story makes it clear that she's protecting him except for that one single moment... and it's been screwed up by an art error. On first read-through, I didn't interpret that scene as Mom attacking Maxon at all. I figured another alien had popped out, so I completely missed any opportunity to see ambiguity. This is why I see this art error as kind of a big deal. I also like to think that perhaps the protective instinct in the Mom alien is warped. Perhaps she's just extra territorial over him, but ultimately wants to eat or cocoon him. I enjoyed this a lot more on the second read. Nice story, art and atmospheric lighting due to the coloring. I agree with Xenomorphine about the mom thing. That's not how you do subtlety and ambiguity. It really went off the rails in that final moment. Looked ridiculous and it made me roll my eyes. That almost ruined the whole comic for me. That was too much. But the style was nice and I take the visuals very seriously, so that compensated it. In some panels I have mixed feelings on the art but it does feel compatible with the Alien universe in terms of mood so I can appreciate it. Not bad, other than the mom thing, I liked a lot of the ideas. But I did feel it was rushed. Though that's not a problem I have with this comic only. I believe 6 issues are the perfect number for telling an alien story. All in all, good. The ideas were better than the execution but it was done well enough for me to appreciate having this addition to the comics. Better than Life and Death certainly, IMO. New podcast is always a great piece of news. I like the comic. It was interesting take and enjoyable read. And artwork is great. There's spoilers in it so, probably better to listen after, unless you don't care. Nice, good job! Do you recommend listening to it before my Dust to Dust TPB arrives in May? Probably not, right lol.